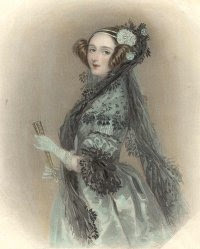 Luckily, times are changing, but women in technology (and many other fields) are still a minority, and that’s why I, as a woman in tech myself, can relate to the idea of Ada Lovelace Day. For me, today is about thanking the women in our lives, who have the power to inspire us all in unique ways. And I’m glad that it’s with the help of technology that I came in touch with several women, who use technology in inspiring ways. Today, I’d especially like to thank Angela Thomas, a researcher with a unique approach to digital media, Alanagh Recreant, who is using technology to promote sustainable development, Aliza Sherman, an unstoppable web pioneer, Chris Collins, a passionate educator and community builder, and Grace McDunnough, an innovative musician and explorer of new worlds. And, last but not least, I’d also like to thank my mom. She showed me that it’s ok for women to know about technology, and she brought computers and the internet into our home at a time when these things were still considered irrelevant by most people. It was thanks to her that I practically grew up with computers and that I saw the great potential of technology from an early age. Thank you all, and keep up with the good work!